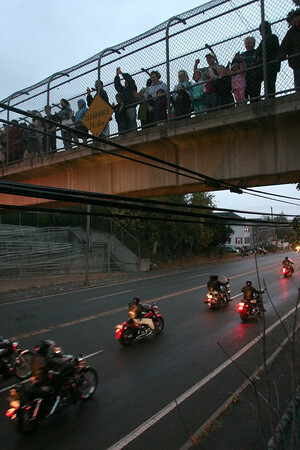 Salem: Children and adults gather on the walkway over Highland Avenue to watch the 5,000 motorcycles that arrived in Salem Sunday evening for the 15th annual fundraiser for Muscular Dystrophy. (Photo by Amy Sweeney/Salem News). Sunday, October 26, 2003 (NOTE: THIS IS A DIGITAL CAMERA IMAGE).